"I've decided that MY life is not a dress rehearsal." What he said is true for all of us. It means our choices matter. Exploring and learning from our experiences are an ongoing part of our journey. A facilitator of personal change, Barbara A. Bernard inspires others to discover their human potential. The other day, a young man told me about a challenge that he had decided to embrace by agreeing to travel to a place far outside his comfort zone. When I asked what him led him make this choice, he personalized a well-known saying, "I've decided that MY life is not a dress rehearsal." What he said is true for all of us. It means our choices matter. Exploring and learning from our experiences are an ongoing part of our journey. A key component of living in discovery is the quest for self-knowledge. It supports us in living a mindful and ever-expanding life. To show up and stay present when challenges or changes occur is a choice. Whenever we feel fear, uncertainty, or anxiety, we can trust that there is a wealth of information within that situation if we are willing to examine it. We are at the portal of self-discovery. In my own life of discovery, I've been seeking to learn more about my capacity to be tenacious, to persevere, and to develop grit. To me, grit is the willingness to carry on when I perceive circumstances as challenging or beyond my current skill or ability level. Making the choice to be mindful and see what possibilities are in the challenge, rather than choosing an escape route, creates further opportunity for me to continue to grow. I'm reminded of an interaction I once observed between a college student and a mentor. Looking at the floor, the student mumbled several excuses. 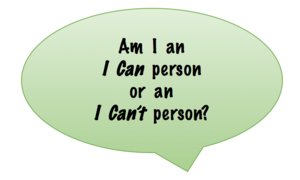 The adult mentor gently asked him to look at her and then queried, "Are you an I can or an I can't person?" This is a question we can all ask ourselves. When challenges or changes arrive at my doorstep, I can interpret them as threats or as opportunities. Often my initial response is automatic: the trapdoor of my mind slams shut before I can even consider novel ideas or new responses. Investigating into what has prevented me from showing up in moments of change and challenge has allowed me to develop a new approach. 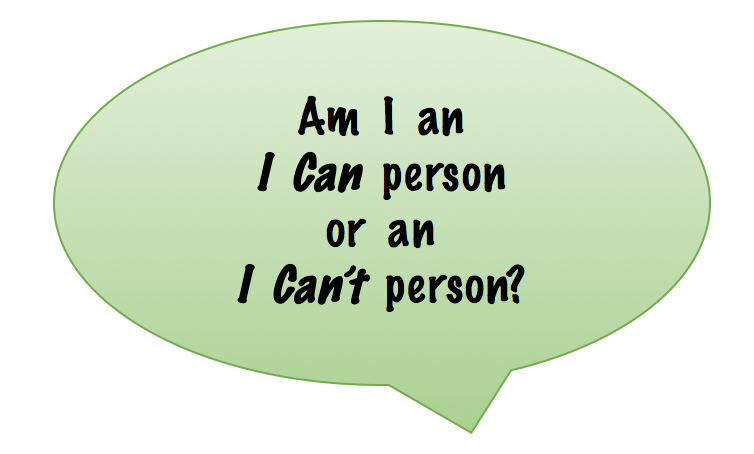 I've learned that when I react with a quick, immediate response, it's usually some version of "I can't." Now, when that comes up, I ask myself, "Is that really true?" This is my way of challenging what I've identified as wonky thinking. I've previously described the wonky state of mind as out of balance because it holds me back with outdated beliefs, unchallenged perceptions, and unrealistic limitations. Wonky thinking is apparent in the excuses that show up when I get fearful, uncertain, or anxious about how I might proceed. For example, I could claim my ethnic heritage as a reason not to try something. In my case, I might say, "People with Norwegian-American heritage like me don't do things like that," or "I was taught not to behave that way," or "We don't do that where I live." Other times I might call attention to a different attribute and say, "Women don't do that," or "That's out of the question for someone my age." Well, I can guarantee you that you can find examples of people in any category of age, gender, ethnicity, belief system, or background who will break open any limiting ideas you hold about them. Recently I was talking with a woman who recounted a litany of events in her personal history to justify why she couldn't do many things. When I hear excuses like these, it signals to me that there are stories from that person's life calling to be reframed, stories that were written by a less-mature self. When the woman and I unpacked the many factors that were operating in the childhood stories she'd been unwilling to consider before now, she became much more compassionate toward others and herself. Painful stories from childhood often fail to consider anyone else's point of view because we're too young at the time to contemplate those ideas. Reframing always brings a more compassionate view to any story. Now when the woman tells her stories, they reflect truth and compassion. She no longer uses her particular history as a reason not to grow and evolve. Many of our wonky thoughts come from our childhood. If we have never questioned them, we behave as if they are true in the present, when actually they were rules or ways of being that were suited to a former time. What worked back then may not be appropriate now. To take a moment to reflect or, as I call it, "think about my thinking," is a game-changing behavior. It stops the runaway train of self-sabotage. Your mind is one of your greatest frontiers. Choosing to explore and learn more about your own mind can have a significant impact on your life. Since it's your mind, you have a front-row seat to be the investigator of the world within you. When you make the decision to take responsibility for your mind, to reflect, and to monitor your thoughts, you create an opportunity to author your own life script. This blog is the first in the series "Harnessing the Full Power of the Mind. "This series explores some of the tools and strategies featured in our forthcoming book, The Art of Living in Discovery: Thriving in Life with Intentional Resilience. Designed to help you to take responsibility for your mind, the blogs offer a variety of ways to become more aware of how your mind functions and how to identify when your mind is wonky. As you play with and practice these ideas, you will find that you can bring your mind back to an inspired state and into balance.